It is France, 1979, my first trip abroad and I’m living with a French family. They have a tumbledown house near Colombey-les-Deux-Églises where most of their extended family seem to live: Mami has a small house opposite, Aunt Didi lives a 10-minute walk up the hill, and an endless stream of cousins drop in for a pastis every day. And, every day, I’m impressed by how much good food forms a natural part of their lives. Lunch is always civilized, though simple. The grown-ups sip kirs and the children sirops. The table is laid with salads: grated carrots, rounds of tomatoes with shaved red onions, wafer-thin slices of cucumber with chives and – finally – long, deep pink radishes with a pat of cold butter and a dish of flaked salt. For a girl who thought that prawn cocktail was a proper starter, an abundance of vegetables wearing nothing but dressing (or, dear God, wearing nothing at all) seems recklessly casual. But, as we break into the baguette – and mop up vinaigrette with bits of its fluffy interior – I make a mental note to do this when I get home, because these crudités variées seem like the perfect way to start a meal. And the most beautiful part of it is the screaming pink radishes. 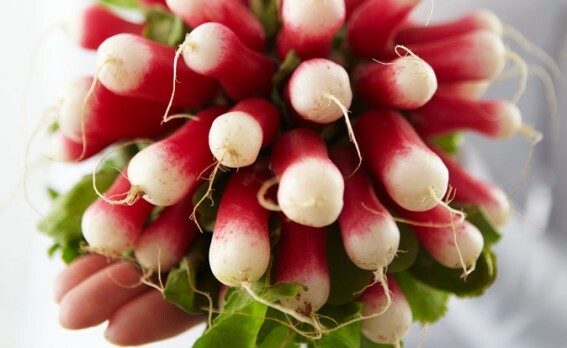 I had to be told how to eat them – it seemed odd to butter a radish and sprinkle it with salt – but the mixture of creaminess and peppery freshness is seductive. Since that trip, radishes have been my fallback ‘starter’. Guests arriving in 30 minutes? Well, I’m going to behave like a French woman and put together a platter of little appetizers. Big white plate, bunch of crimson radishes, warm hard-boiled quail’s eggs (or hen’s eggs if you want the spread to be more substantial), bowls of tapenade and anchoïade, butter and salt. Even when I have time to make more complicated things, I love serving this. It looks gorgeous, it makes everyone use their hands so it encourages people to share and chat. And for half an hour I get to feel French. Whichever variety you like, buy radishes with spanking fresh leaves (not wilted) and firm, taut flesh. As well as being good with simple accompaniments, radishes make lovely looking salads, shaved into wafer-thin teardrops and tossed with capers, chopped anchovies or black olives, peas or fennel. (I also love them in a more northern salad with spelt, pea shoots, blueberries and a dill-buttermilk dressing.) They provide crunch, colour, prettiness. One final practical word: chilling is important with radishes. Their flesh crisps up beautifully when immersed in iced water. Even radishes that aren’t at their perky best can be resuscitated in this way. 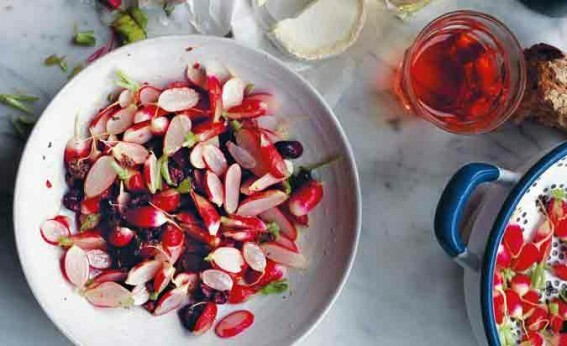 You really do want le crunch when eating radishes. Something the recklessly casual French know well. This is lovely with a chunk of chalky goat’s cheese and absolutely fantastic with cold roast beef or lamb: the strong flavours go so well with meat. 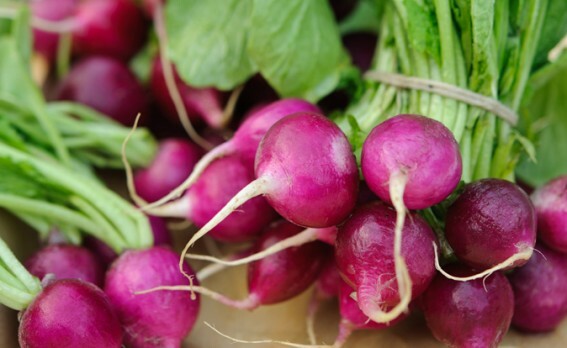 You don’t have to use white balsamic vinegar – I know not everyone has it – but it means the lovely white and pink radishes aren’t tainted. 1. 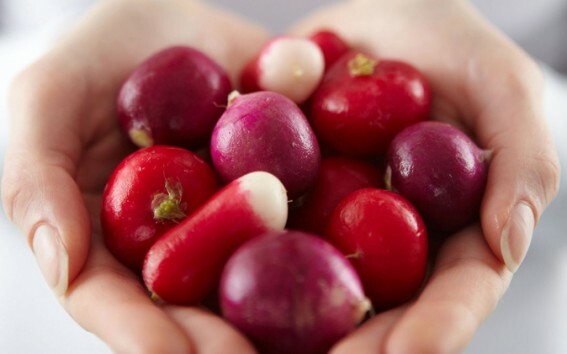 Wash the radishes, trim and, if they have good leaves, carefully pat these dry and set aside to go into the salad. Cut the radishes into thin slices (if you have French breakfast radishes, cut them lengthways: this makes lovely teardrop shapes). 2. Pit the olives, or slice the flesh off the stones if they are hard to pit, and chop. Toss everything together in a shallow bowl along with any reserved leaves and serve immediately. Don’t be tempted to add salt – the ingredients are salty enough. A classic Provençal olive spread. There are different versions – I also make a tapenade with tuna – but this has a good, pure olive taste. The flavour brings to mind that quote of Lawrence Durrell’s, that olives taste ‘as old as cold water’. If you use Niçoise olives – and they are the best for this – they are impossible to stone with an olive stoner, so just cut the flesh from around the stone. Laborious, but worth it. It’s also lovely spread on croûtes, topped with goat’s cheese and grilled until golden. I stir dollops of it into pasta or warm waxy potatoes, to toss with roasted tomatoes and steamed green beans too. If you don’t want to serve it immediately, put it into a pot and pour a layer of olive oil over the top to seal. It will keep in the fridge for about 10 days. 1. Put all the ingredients, except the olive oil, into a mortar or a food processor. Whizz or pound to a rough paste, adding the olive oil as you go along. (It’s hard work in a mortar, so I generally make this in the food processor.) Scrape into a bowl. This is my version of a rich and perfumed anchoïade from an old gastronome and food-writer called Austin de Croze. 1. Soak the figs in enough just-boiled water to cover and leave them to plump up, then drain. Halve the pepper and remove the seeds and stalk. Brush with a little regular olive oil and grill until charred and blistering. Set the pepper aside and, when it’s cool enough to handle, peel off the skin. 2. Put everything into the food processor (including the anchovy oil) and blend. Scrape into a bowl and serve. You can add crumbled goat’s cheese to this as well if you want. 1. Simply mix everything together. This tastes better after it has been sitting for a little while so the flavours can meld, so cover with cling film and put it in the fridge for a couple of hours. Don’t serve straight from the fridge, though, let it come to room temperature first. Thanks to loveradish for the photo.